Distribution: Throughout the world's temperate oceans, sometimes around Britain in warm weather. Habitat: Rocks and crevices; seabed. Description: Bag- shaped body, with bulbous head and eight tentacles. Skin colour varies to match the environment. Weight: up to 25kg. Females mature at 1kg, males at 100g. Food: Mainly crabs, crayfish and molluscs. The octopus is an invertebrate animal (it has no backbone) and belong to the phylum (group) Mollusca. Its closest relatives are the various species of squid and cuttlefish. Snails and slugs are distant relatives of the octopus. 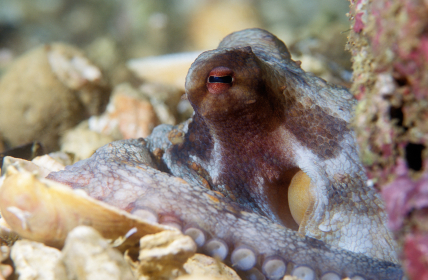 The common octopus has a relative called the giant octopus, whose tentacle span is up to 7metres! These huge creatures live in deep water along the northern Pacific coasts from the Sea of Japan east to Alaska and south to California.